Ronald Leslie Rooke was born on December 7, 1911 in Guildford, Surrey. 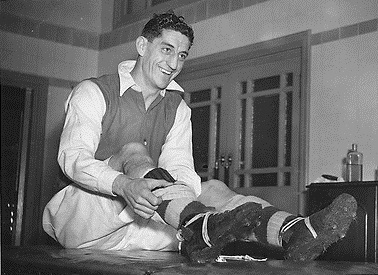 His football career started with his local club Guildford City and he went on to play for Woking (1932–1933), Crystal Palace (1933–1936) & (1949–1950), Fulham (1936–1946), Arsenal (1946–1949) and Bedford Town (1950–1953). He then went to Haywards Heath Town and Addlestone as player manager before returning to Bedford Town (1956-1961). During WW2 he served as a physical training instructor in the RAF. Rooke played as a centre forward and was a natural goal scorer scoring 170 goals in his 256 appearances (.664 GPG). 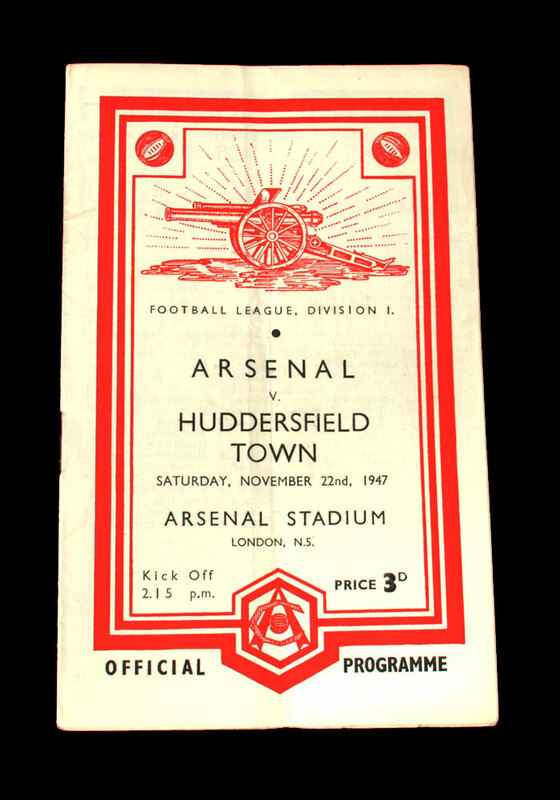 Arsenal were bottom of the table at Christmas and having signed Joe Mercer in November, we required some extra firepower up front, too. Rooke was signed in December of 1946 for £1,000 plus two players, Cyril Grant and Dave Nelson. He was the ripe old age of 35 and had never played for a top flight team. He made an immediate impact by scoring the winner on his debut, against Charlton Athletic and by the end of the season had taken his total to 21 goals from 24 league matches (.875 GPG) and helped Arsenal finish in mid-table. 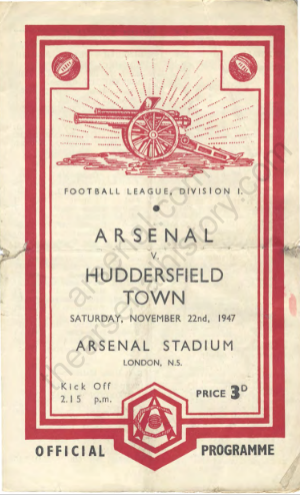 In the first game that I watched at Highbury (Nov 2, 1947) I was fortunate enough to see Rooke play against Huddersfield Town, Arsenal won 2-0 with goals from Ronnie Rooke himself and Jimmy Logie. That season (1947/48) he scored 33 league goals a total that made him that season’s First Division top scorer; in the final game of the season he scored 4 goals in the 8-0 demolition of Grimsby. This entry was posted on Saturday, March 23rd, 2019 at 8:07 am and is filed under Uncategorized. You can follow any responses to this entry through the RSS 2.0 feed. You can leave a response, or trackback from your own site. GN5. Terrific. And what a player. Of course I knew of Ronnie Rooke but had no idea he was 35 y.o. when he signed for us. chas. Brilliant pics as always. How did you find that programme? Re this mornings vids. The Cilla/Bolan one was awkward and I may not like Billy Joel but that video was full of memories. I once went to a meet and greet with Billy Joel, He started by saying that despite being short and ugly he was able to marry the extremely beautiful Chrissie Brinkley, which according to him, was proof that fame and money are aphrodisiacs! May not like his music but a top bloke. Exactly how old was Rooke “claiming” to be in that photo? This is the only clip of Ronnie Rooke I could find including a goal. It sounds a bit like the game was played in an interlull !!! British Pathe video – I was possibly in that crowd. I wish I had it in my personal collection – it would take pride of place- but I’ve copied the image and I will print it out on heavy photo paper. Here’s link to another photo of it without the stamp across it. The site from which that photo comes is very interesting. Thanks Chas I’ve copied both images. Chas, who were Arsenal playing in your video, I cannot understand the commentator it sounded like he called them the French team. I’ve checked both league and cup games for both 1946/47 & 1947/48 and there were no 4-3 defeats shown, so you are correct it must have been a friendly of some sort..
I’m off for the day in a few hours, we will be with our family to celebrate our grandson’s 10th birthday. True to form he is already an Arsenal fan – my son has bought him an Arsenal kit for his birthday and we’ve got him an Arsenal football. If my knees were not shot I would go out on a kick about with him, but I will happily watch. 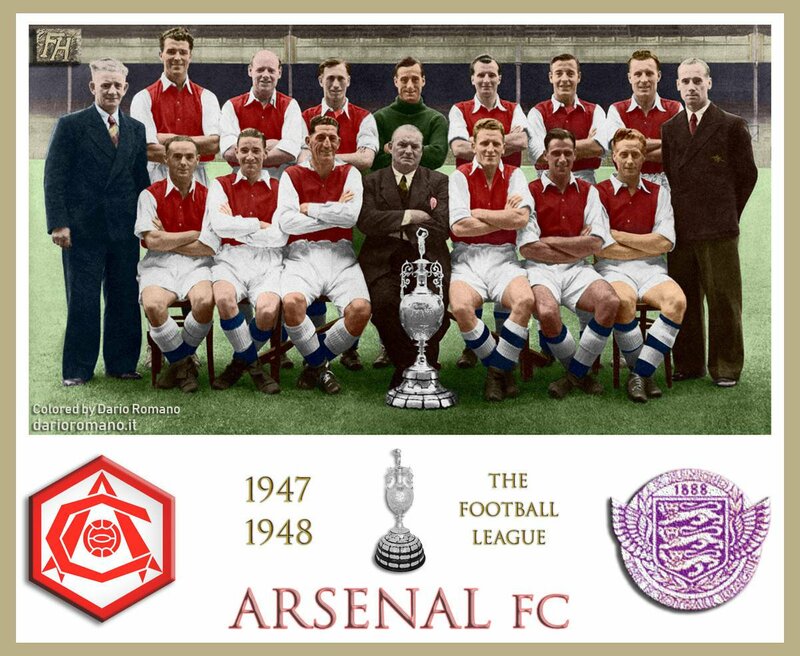 Looking at all the players in that 1947/48 team photo, as if they were looking back at me, I wondered if you knew whether any of them are still alive. I guess the answer is ‘no’ as any survivors would be around 100 years old now, and that gives a reminder of how short our lives are. That game was part of a series of friendlies against Racing Club de Paris. See here. Thanks Chas, I have absolutely zero recollection of those games, but given the sparse media coverage back then it’s not at all surprising. Wasn’t our 47/48 team, the oldest to ever win the English championship? Bryan Jones there, sitting first left, had a newsagents in Green Lanes, I got his autograph a couple of times, lovely gentleman. Jimmy Logie, sitting next to Jones, ended up selling newspapers outside of Leicester Square Tube station. Fred. Good to see you back. Are you fully recovered? What national group games is this again? Warm weather training for the @Arsenal team in Dubai today. Wow, what an amazing read, you remember your first game in 1947? I can’t remember who we played 3 weeks ago.